Hello my design devotees! I’m working from home on this dreary Monday Dallas morning. One of my little princesses is home sick. I’m sourcing for a couple of different projects I am working on right now & I came across this photo I had saved in my “Style File” on my home computer. There are so many things I love about this! For starters, the chest is covered in zebra hair on hide & tricked out with silver nail heads that define this yummy piece. The top is covered in glass to ensure a safe place to set your accessories, lamps, etc. The mirror above the chest is so fun & really makes a gorgeous contrasting statement to the mustard yellow wall color. If mustard yellow walls scare you, you’ll be happy to know that this ensemble would be just as chic on a crisp white wall. Small infusions of color help tie this chic setting up in a pretty little package. The turquoise lamp & sunny yellow gourd vases say “Hello!” with just the right amount of energy to accessorize the space. Want this look in your home? Contact an IBB designer today. 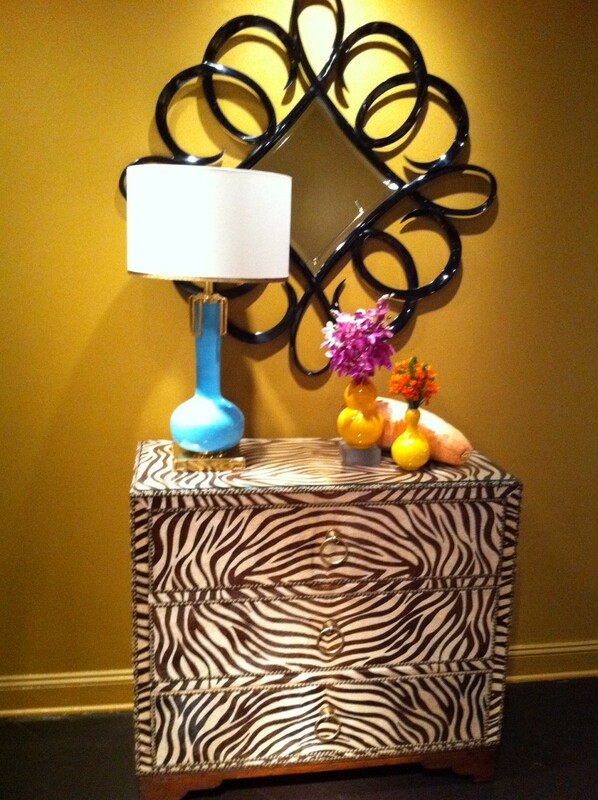 All items pictured are available at IBB Design Fine Furnishings.